One of England's greatest and most famous poets was Alfred Lord Tennyson. Born in 1809 and dying in 1892, this wonderful writer, crowned "Poet Laureate of England" by Queen Victoria, maintained a deep, religious sense and a genuine capacity for mystic experience. Educated by his father in his early years, this shy man, distasteful of society, published his first book when he was only 17, and in his entire 66 years of writing, never wrote a line of prose except for some dialogue in some of his plays. 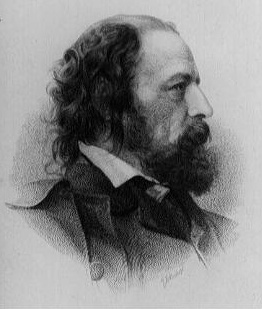 In the following poem, Tennyson memorializes a suicidal charge of 637 British light cavalry on October 25, 1854, across open terrain in the Battle of Balaclava during the Crimean War. To help understand the poem, a "league" represents a unit of distance equal to 3.0 statute miles; half a league, therefore, would be a mile and a half. Just think of it: six hundred thirty seven horses under rider, sabres drawn, kicking up dirt and dust at a full gallop, charging wildly into an onslaught of awaiting cannon. Oh! How the adrenaline . . . and fear . . . must have been flowing in this truly powerful and memorable poem, The Charge of the Light Brigade ! "Forward, the Light Brigade!" Was there a man dismayed? Not though the soldiers knew someone had blundered. Cannon in front of them volleyed and thundered. Into the yaws of death, into the mouth of hell rode the six hundred. Sab'ring the gunners there, charging an army, while all the world wondered. Cossack and Russian reeled from the sabre-stroke shattered and sundered. Then they rode back, but not--not the six hundred. When can their glory fade? Oh, the wild charge they made! Honor the Light Brigade, noble six hundred!